Indulge with our Apple Martini Bath Salts. With the sweet and tangy scent of freshly sliced green apples they're so refreshing. Use as a bath salt or shower salt (see usage suggestions below). Cheers! 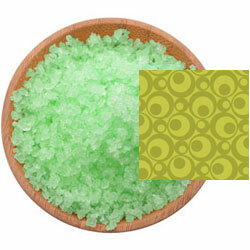 A fine/medium grain blend of Pacific Sea Salt with the a sweet & tart scent of green apples in a green color.